Hi there and happy Saturday! 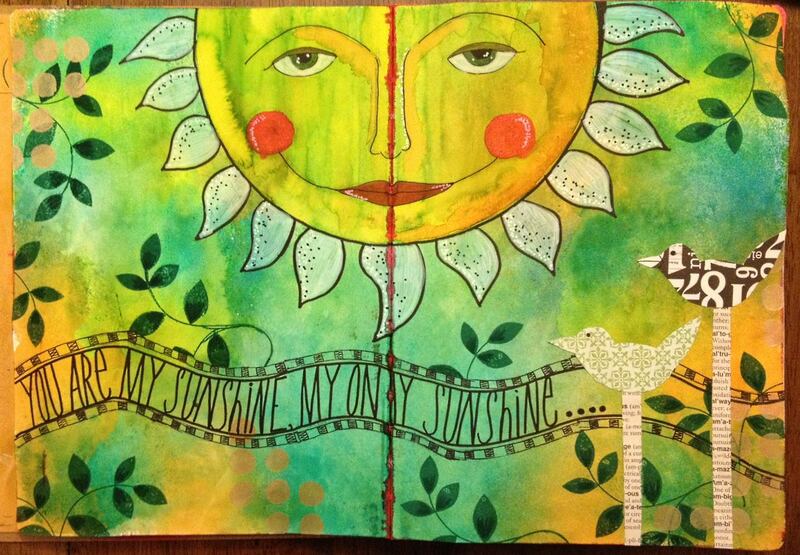 Excited that it's the weekend and hoping I can find some time to play in my Dylusions journal! I am in love with my journal and I shared a bit more about my journey into free form creating on my blog yesterday. Check it out for specific details on the page below. Today I wanted to share some of the pages I've been working on and a bit more about the products that I am LOVING! To start....Embossing Paste from Wendy Vecchi. If you don't have it...your life won't be complete until you get it! I tried the white out for the first time last night (see the page above) and talk about fun! Oh my...Great texture and dimension! I plan to add a bunch more to the page but had to just share what the plain white paste looks like. I also used Wendy's Large Heart stencil and the Chevron stencil from The Crafters Workshop. Speaking of stencils, I'm enjoying using Dyan's collection for my borders (the Letter Jumble stencil was used on the edges of the pages above) and Wendy's for larger spots (the heart) and The Crafters Workshop for everything in between! Now let's talk Dylusions Ink Sprays...They are amazing and so much fun! I've been playing with different color combos, different designs, and have spent some time just inking the journaling pages and leaving them for further decoration later. Speaking of the journal...get it. No, I'm serious. If you love this kind of work, the journal is perfect. Great size, really heavy duty pages, a ton of pages, and a great heavy duty cover. Beautiful backgrounds... and I love art journals for the insight they give into the creator's processes! Wow, Kim! LOVE these! Gonna have to put the paste on my next order for sure!! I love journalling and cannot wait to get some of the embossing paste. Love the background on the first journal spread. It's so vibrant and has lovely texture and dimension. The second spread is fabulous! That sun makes me smile! Great inspiration. I think I'll be getting some of that embossing paste. Amazing results. Fabulous pages, Kim! I'm with you on the journal and the ink sprays... LOVE 'em! Can't wait to try Wendy's new paste.